The Chicago International Movies & Music Festival (CIMMfest) is showing a wonderful documentary, titled “The Sax Man,” about Cleveland’s most iconic busker, Maurice Reeder, Jr. The film will be shown on Sunday, May 4 at 5pm at The Society for Arts at 1112 N. Milwaukee Ave.
CIMMfest has been kind enough to offer a discount to all fans of CSM. Go to http://cimmfest.org/sax-man, click on “get tickets,” and enter the code “street music” for a $3 discount. Don’t miss the opportunity to see this powerful and moving film about the life of a street performer! CSM will be participating in this year’s edition of Chicago Ideas Week. In conjunction with the “Chicago: Big Shoulders, Big Future” talk taking place on Tuesday, October 15th from 4:00 to 5:30pm at the Edlis Neeson Theater at the Museum of Contemporary Art, Chicago Street Musicians will be involved in “activations” before and after the talk. Musicians George Banks, Jeff Dickinson, Christopher James and Milly Mango will be playing and available for conversation at the event. CSM will be at the MCA from 3:30 to 6:30pm. Chicago Ideas Week is a premier annual gathering of global thought leaders created to provoke new ideas and inspire actionable results. Their goal is to stimulate new initiatives and ventures, create new connections and collaborations, and establish a community of people who have the desire to achieve great things. 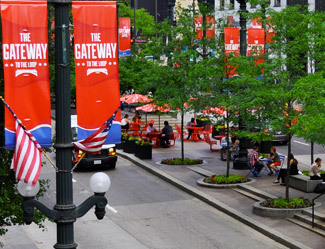 Starting early August, Chicago Street Musicians will be performing in the Loop as part of the Chicago Loop Alliance’s Gateway Project. Listen out for them! Founded in 2005, the Chicago Loop Alliance is focused on promoting and uniting Loop businesses and organizations to support one another in creating a vibrant, flourishing Loop where people live, work and play. The Fusion Yoga Music Festival is looking for street performers to participate in their event which takes place in Naperville in 2013. You can find out more information at their website: www.fusionyogamusicfestival.org. If you are interested in participating, please contact Jeri Gender at gjender@comcast.net. Please support the Drum Beat Journey (DBJ) project as it seeks to document the lives of four African American male bucket drummers from the South Side of Chicago on their musical pilgrimage to West Africa. You can support the DBJ project here. Using the bucket drum as a conduit to release intense emotions and explore their inner imaginative spirits, the film will document the lives of Demetrius, D’Quan, Dante, and DaMonte, four young men from the heart of one of the roughest neighborhoods in the city who have allowed their souls to guide them to a place their minds never deemed possible. The drummers will participate in a two-week training program with Senegalese percussionists. The musicians are set to leave for Senegal June 20, 2012. Donations are needed to ensure the success of this project. DBJ is currently asking donors to contribute to help us reach our goal of $20,000. The fundraising deadline is May 16, 2012. The production crew is donating their time. If you would like to donate, you can do so here. Learn more about the Drum Beat Journey project here. Chicago Street Musicians has partnered with Potbelly Sandwich Shop during the months of April and May to bring street and subway performers into their musical rotation. Chris James (Hendrix-esque guitar talent! ), Charles Pryor (trumpet), Asha and Martin (vocal and guitar duo) and Kaliq Woods (clarinet) will be performing on Tuesdays and Thursdays from 12 to 2 PM at six downtown Chicago Potbelly locations. Full schedule on our events page. Born from humble beginnings as a small antique shop on Chicago’s North Side, Potbelly Sandwich Shop has grown from one to more than 200 neighborhood locations. More here. During the months of May, June and July, CSM Founder and Director, Gabriel Chapman, will be touring the United States, Canada and Europe with his band, About A Girl. During the tour, he plans on meeting and performing with street musicians in every city in which the band plays. You can view the latest list of tour stops here. The list is updated daily. CSM recently purchased professional audio and video equipment and will document Gabriel’s experiences on the road. We will post new pics, audio and video regularly and plan on releasing a street performance compilation video late summer 2012. Despite the demands of a busy touring and recording schedule, Crystal Bowersox, former Chicago street musician and American Idol runner-up, recently took the time to drop us a line. She also made an extremely generous donation to CSM through our website, which she said, “was the least she could do.” Throughout AI, she was consistently viewed as staying true to herself, and it was wonderful for her to reach out to us with so much generosity. She is currently working on a follow-up to her debut album, though no release date has yet been set. You can sign up for a free download on her website: http://www.crystalbowersox.com. You may also remember Crystal for her involvement in our Sweet Home Chicago video, which you can view here. Kristopher Rey-Talley recently directed and produced Chicago: The Great American City. 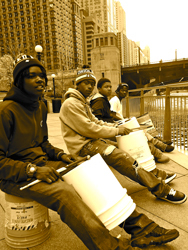 The film, which features gorgeous black-and-white views of the city and its inhabitants, includes shots of Cortez Harrington and three fellow bucket drummers performing on Michigan Avenue. You can watch the film here. In Turkish, the term “subway musicians” is written “metro müzisyenleri.” Check out the trailer for a beautiful, soon-to-be-released documentary about street musicians in Turkey, Metro Müzisyenleri, by Osman Çakir. Read Irish Mae Silvestre’s Arts & Entertainment blog post on CSM here. Here’s an excerpt: “It’s rush hour at the Clark and Lake subway stop. A frantic flurry of coats and briefcases marks the beginning of the end of the day. And then it ducks and weaves through the crowd: a violin’s sweet, sorrowful song permeates the tired old tiles of the station. Trains barrel in and out. Yet a handful of commuters remain rooted to the spot – for now, home and other destinations can wait. Please take a look at the recently-completed documentary, Music In The Air, from Alex Mechlin. From the underground subways to the busy streets of downtown Chicago, this film gives you a look at the lives of street musicians. It explores their motivation to perform before an interactive and usually mobile audience, views on music appreciation, and opinions on regulations which govern how and where street musicians can perform. While they may be ignored by passers-by and overlooked by city laws, the exuberance of playing music cannot be disregarded. We’d love to hear your stories and thoughts about street musicians and performances in Chicago (or another city). Tell us about your favorite performer or how hearing music on the streets or during your commute makes you feel. You can share with us by emailing your story to submit@chicagostreetmusicians.org. Thank you to everyone who attended the launch of our Chicago Street Musicians “Sweet Home Chicago” video. You can watch the video below and at our YouTube Channel. The jury of Intercom, the International Film and Video Competition, recently awarded “Sweet Home Chicago” with a Certificate of Merit for its superior quality. This division of the Chicago International Film Festival, Intercom honors the best in Corporate, Industrial, Educational and Interactive productions. Sweet Home Chicago competed against thousands of international entries and won in the “Online/Viral” category. Thank you to Joe’s and Martin Guitars for their sponsorship.